I never fancied myself a photographer of children. "But didn’t you run a portrait studio in Florida?" you might ask. Yes, yes I did. From 2005-2008 I had two studios in Tallahassee, Florida. The first one was tiny, cozy, and quickly outgrown. The second studio was 5500 square feet of fixer-upper heaven, worn down and bleak but with extraordinary promise. I worked to have the entire lobby and offices redone, and was converting the studio areas into something amazing when the opportunity to move to New York came up. I was sad to leave that space and its’ unique potential, but I’ve never once regretted my move to Brooklyn. It took six years of thinking "Do I want one?" but now I share the best studio of all in Crown Heights, Brooklyn, and I am absolutely awash with excitement over what I’ve been creating there. It’s funny, therefore, that I ever won a single award for my portrait work since I never considered myself a portrait specialist. It’s funnier still to have won that award for a portrait of not a client, but my own daughter. This image was taken at her dance recital dress rehearsal. I saw a phenomenal sliver of light in the old high school auditorium she was performing in and pestered her until she sat in it for a portrait. 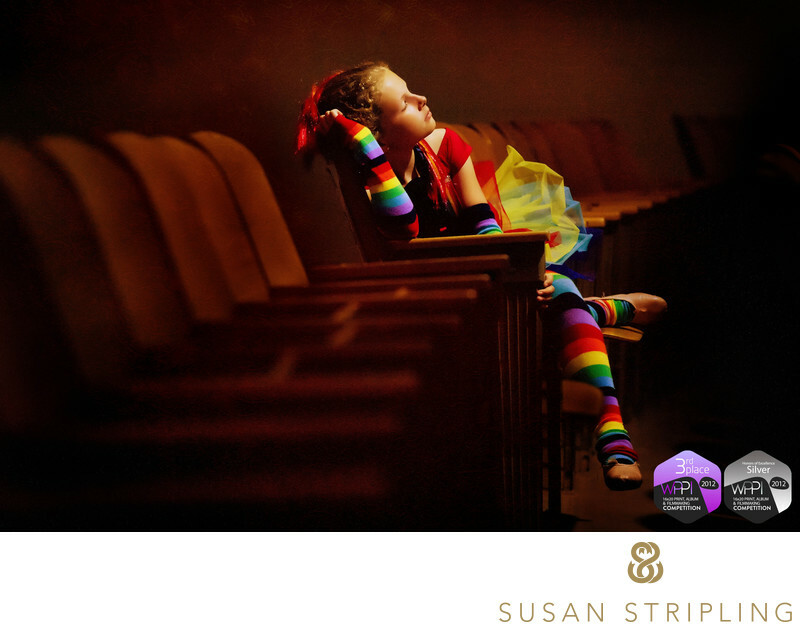 This image took third place in the Portrait of a Child division of the 16x20 WPPI International Print Competition in 2011. A longtime contest entrant in the Wedding Division, I had almost forgotten that I’d entered anything in any other category! Hearing my name called during this division during the awards ceremony was completely surreal. I am so proud of this award, for seeing light in an unusual place, and for bothering my daughter until she eventually surrendered and sat for this portrait! 1/160; f/4.0; ISO 8000; 180.0 mm.